Golf ball compression may determine the distance of the ball. Golf ball compression figures into a golfer's game. Compression rates determine what balls are used by different levels of golfers. Compression creates density in the golf ball, which may affect distance and loft. Golf balls are one of the main components of a good golf game, with compression potentially serving as a major factor in improving your handicap. 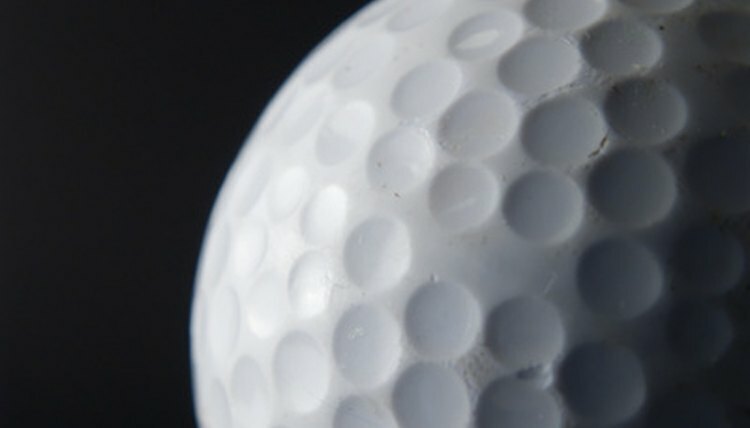 The golf ball is compressed and flattened by the force of the impact. The lower compression of the ball results in the ball ;travelling farther as the club's energy creates energy, transferring it to the ball. The ball's compression handles the high speed and impact of the club, and allows flexibility so that the ball can recoil and not break apart. Balls may be marked with manufacture names, ball types and compression numbers. Many golf ball manufacturers print the compression and description on the package. The compression markings range from 70 to 110. Low compression balls are rated 70 and 80, intended for novice, junior and women players. The low compression balls create more distance and offer beginner golfers a chance to shorten the course with these type of balls. A 90 or higher compression is a hard ball used for low handicap golfers. The golfer must hit the ball harder to get distance, but the high compression ball offers better control. Hitting a ball with a certain level golf seed corresponds to the compression number itself. If a golfer has a lower swing speed, a lower compressed ball will spring more off the club. Conversely, a golfer with a higher swing speed should use a higher compressed ball as the ball doesn't compress as much, traveling shorter distances, but will have more control. When playing in cold weather, a higher compressed ball will have the feel of a rock because of the density and cold temperatures. During cold weather, you may want to use a lower compression ball to provide some added flexibility coming off of the club. How Do I Select Golf Ball Compression?